My farrier showed up earlier than expected, which was nice since its only going to get hotter this afternoon. He was surprised at the dings Blaze had managed to inflict on that poor hind leg but as we know, Blaze isn’t the most graceful guy in the world. With his constant itching and rolling, and the interfering in the way he travels, it was definitely just time to get the steel shoes out of the equation, at least in the hind. I definitely hope to be going all Easy Boot all the time with both horses by next season but for now I will go front shoes with Blaze and hopefully be able to finish our endurance season safely and happily that way. It really stresses me out to see a scratch on Blaze, let alone two cuts caused by something I technically did to him by shoeing him. I feel better just having the hind shoes off and hopefully things will start healing quickly now. 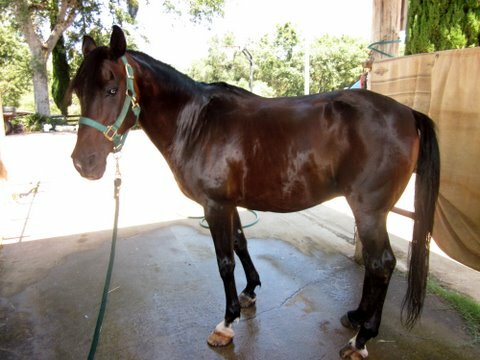 I noticed that his mane was a little greasy and its wicked hot so I decided a thorough bath was in order (for him, not me–though I pretty much get a bath giving him a bath!). Cowboy Magic shampoo and conditioner works such wonders, though I have the darndest time trying to wash his head and forelock, I usually just end up wiping his head with a damp cloth and I haven’t managed to soap up his forelock, it seems like a soap in the eyes and ears waiting to happen. 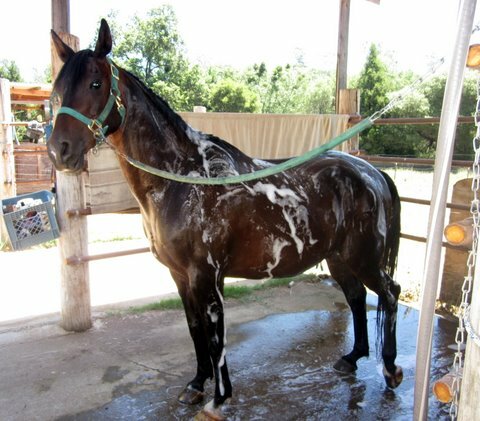 Blaze puts his head high and rolls his eyeballs to look at me like I’m nuts when I put the hose high up on his neck, so getting soap and water near his forelock and actual face is a challenge waiting to be conquered I guess. De-worming was in order as well so we took care of that, and with the shoes off, a thorough bath, and a handful of carrots, it was nice to spend some time loving on my Blaze!